So I'm pretty tired this Sunday eve (what else is new) but I wanted to whip up an easy yet delicious dinner. Mr. Fo requested pizza (his food of choice), so homemade pizza it was. Full disclaimer: By homemade, I mean pre-made dough and pizza sauce. Between you and me, I don't make a great pizza dough...every time I make it from scratch it turns out "eh." So I don't feel too guilty about using pre-made dough. But I must feel guilty enough to give the topic a few sentences. Moving on. So, back to the pizza. I knew I wanted to use prosciutto, because I had it on the brain. (Totally normal to have prosciutto on the brain, isn't it?) I knew it paired well with arugula so I searched for the combo on the Internet. The recipes I found didn't have enough cheese, which was clearly a problem. Roll out your pizza dough as thin as it gets on a baking sheet or pizza stone covered with olive oil and flour. Sprinkle the crust with flour and cornmeal to get the floury, crunchy crust you'd find in at a pizza joint. Yes, I just said pizza joint. Spread a light layer of pizza sauce on the crust. Don't over saturate with sauce, the thin pizza crust can't handle it! Using fresh mozzarella, (I used a ball about 8oz. in size) break up the cheese into pieces and scatter evenly around the pizza. Don't skimp on the cheese. More cheese to come. Put the pizza in a preheated 450 degree oven for about 20-25 minutes until the crust is golden brown and the cheese looks like the below picture. Don't be afraid to cook your pizza for awhile, the longer you cook it, the crispier the crust will be. Now take a bite and say OMG! 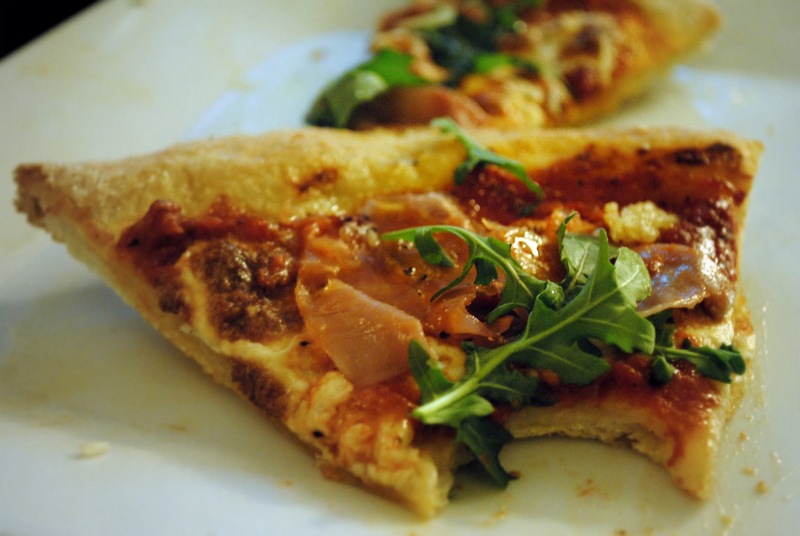 This is a great pizza to serve for an easy weeknight dinner. Better yet, cut it into smaller pieces and use it as an appetizer for a party. It's so freaking good. Enjoy! Have a great week! Mmmmm....sounds delish! I can't wait to be able to eat pizza and cheese again!